Why Is The Federal Government Shutting Down A CES Booth Over A Patent Dispute? One of the big stories coming out of CES this week is the bizarre situation in which US Marshals showed up here at the event yesterday and completely shut down the booth of a Chinese company, named Changzhou First International Trade Co. This happened after a judge granted a motion for a temporary restraining order, filed by US company Future Motion, following a seven minute hearing about the matter, in which Changzhou was not present and had no say. To be clear, it does appear that Changzhou is building a knockoff of Future Motion's one wheeled self-balancing scooter thing -- a device that got plenty of attention via a big Kickstarter campaign. 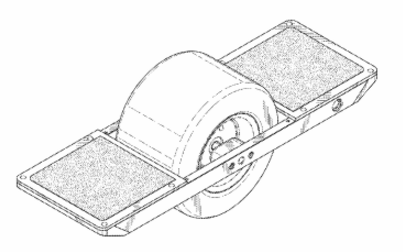 And, Future Motion does hold both a patent on a self-balancing skateboard (US Patent 9,101,817) as well as a design patent (US D746,928), which was just granted a few days ago, on a device that obviously looks quite a lot like what both companies are selling: In other words, there's a fair bit of evidence to support that the patent infringement case is fairly strong. That said, it still seems quite troubling for US Marshals to then get involved and completely shut down Changzhou First International Trade Co.'s booth at CES right in the middle of the show, when the company doesn't get a chance to present to the judge until January 14th, long after CES has packed up and left town. If there's a legitimate patent infringement case here, as there may well be (even though I'll have some more to say about patents in this space in an upcoming post...), it's still troubling that the company got shut down in the middle of the trade show and that it involved the US government intervening in what is a civil issue. This is certainly not out of the ordinary in general. Part of the job of the US Marshals is to execute seizures related to restraining orders that are ordered by federal courts. But it still seems like pretty massive overkill for a company that's just showing some scooters at a trade show, and where they haven't had a chance to present a defense. For this week's awesome stuff post, we've got three crowdfunding projects that involve new "electric" transportation devices that help folks get around. First up, we've got The Derringer Electric Bike. Calling it an electric bike seems to undersell the Derringer, which is inspired by classic board track racers, which were more like motorcycles than bikes. Think of this as more like a beautifully designed, stylish moped. Of course, with beauty and style (and effectiveness) comes a hefty price tag. There's a non-motorized one that runs $1,800, and then the actual electric bikes run between $3,500 and $6,500 depending on the model. At that price, as beautiful as they are, it seems like a tough sell. Indeed, so far it looks like only a single one (a $6,500 model) has been sold, making it quite unlikely that the Derringer will reach its $75,000 goal in about a week and a half. If the Derringer isn't your thing, but you still want an electric bike, you might want to check out the Riide, which looks much more like a standard every day bike, but has a fairly powerful electric motor and battery built-in. For an electric bike, it's surprisingly lightweight, and gets speeds up to 20 mph (same as the Derringer above). And, the pitch video includes some poetry. These bikes are also a hell of a lot cheaper than the Derringer, coming in at $1,799. And while only 28 have been sold at the time I'm writing this it's already enough for the Riide to have surpassed its target of $50,000, with still over a month to go. Okay, okay. Enough with the bikes. Let's get down to just a single wheel, and something that's a bit further along the awesome spectrum. How about the Onewheel, which is sort of a skateboard-like device with a single giant wheel, electric motor along with gyroscopic and accelerometer sensors in the middle. The folks behind it claim that it was inspired by the hoverboard from Back to the Future, and whether or not that's actually true, it certainly has a unique cool-factor to it. There are also a few comparisons to snowboarding or surfing, but on the pavement, and watching the video you can certainly see the similarities. These devices run between $1200 and $1800 depending on configuration and if you get in on various early bird deals. No matter what, they're just under the target of $100,000 with over two weeks to go, meaning it will almost certainly get funded. That's it for this week. Head out and ride somewhere. Also, the "favorites of the week" post has been on a bit of a hiatus over the holidays, and that's continuing this weekend as well. Fear not, it will return soon.